The Center for Disease Control says that the number of people with doctor-diagnosed arthritis has climbed from roughly 46 to 50 million over the last few years. This is in line with predictions based on the aging population. Establishing arthritis as a disability for Social Security claims can be tricky, but a strong case is possible with the right medical records. 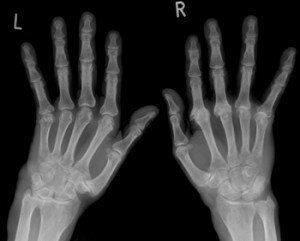 In spite of promising new drug treatments, arthritis is still a major disabling condition. The disease eats away at cartilage, tissue and bone. It causes unremitting pain, and can sometimes be seen in the twisted fingers and painful joints of its victims. The Social Security Administration (SSA) regulations view some forms of arthritis as orthopedic impairments, and some as autoimmune disorders. Osteoarthritis is evaluated as an orthopedic impairment by lab tests and effect on soft tissue, bones and joints. Other forms of arthritis such as the connective tissue, psoriatic and rheumatic forms of the illness (lupus, sclerosis and scleroderma) are evaluated under the autoimmune regulations. Any case requires more than simple findings of reduction in mobility and reports of pain. The physical findings must be supported by appropriate lab tests or a biopsy. The autoimmune regulations were recently revised to take into account updated treatment modalities. An examination by a rheumatologist is optimal, but may not always be practical. Unfortunately, it is rare that SSA will send a claimant out for a consultative examination with a board-certified expert. X-rays are routinely done, but x-rays do not show soft tissue and cartilage damage and may not show bone deterioration. Recent regulatory changes recognize the superior forms of evidence that can be provided by MRI’s and CAT scans. SSA says, however, that these are “quite expensive and we will not routinely purchase them.” If you are fortunate enough to have a treating physician who will order these tests, you are in a better position to win your claim. Showing functional limitation is an integral part of proving a case. Along with detailed medical records, it is helpful to have clear statements from doctors and witnesses about limitations in use of hands, use of arms or legs, and ability to sit, stand and walk. It is particularly important to note fine motor skill problems, such as inability to write or hold a pen or coffee cup. If repetitive motion exacerbates pain, this should be noted. There is a big difference in being able to lift something once and being able to lift multiple times during a day. If you must lie down and rest for extended periods, it is important to have this noted in the medical records and letters of observation. The combined effect of arthritis and obesity should be considered where appropriate. Social Security disability law asks whether a person is able to do full-time work on a predictable, consistent and productive basis. Ability to work on a hit-or-miss basis is not enough. the best possible way to win your case. If you would like a free consultation to establish arthritis as a disability, call our office. Arthritis Foundation – National non-profit dedicated to help people suffering from arthritis through research, education and outreach. Arthritis.com – Information on different types of arthritis, treatment options and alternative therapies. Disability Evaluation Under Social Security – Information from the SSA site on the requirements for claiming arthritis as a disability.